Edibles are central to Lisa Myers’ examination of personal and Native Canadian histories. Lisa Myers: strain to absorb (2015). Production stills. All images courtesy the artist. This fall, Lisa Myers is the Art Gallery of Ontario’s Artist-in-Residence. The artist, who is of Anishnaabe ancestry, is also a curator, musician and chef. At the AGO, she will draw on her interest in food and story-sharing to explore the meaning inherent to her materials. Myers’ work has been featured in exhibitions at institutions including Urban Shaman, Peterborough Art Gallery, MacLaren Art Centre and the Art Gallery of Ontario. Before her residency began, she met with Magenta contributor Krystina Mierins at the gallery for a conversation about her practice and her project planned for Nuit Blanche. Lisa Myers: Through Surface Tension (2013). 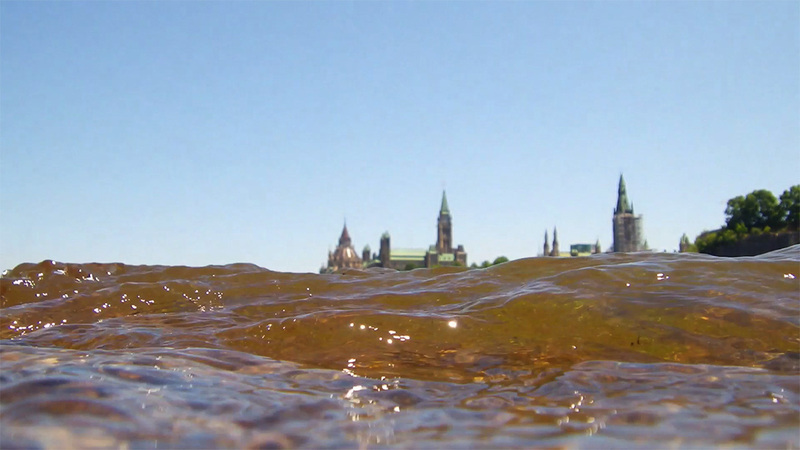 Still from a digital media file of footage recorded around the Great Lakes. Krystina Mierins (KM): What are your plans for the residency? 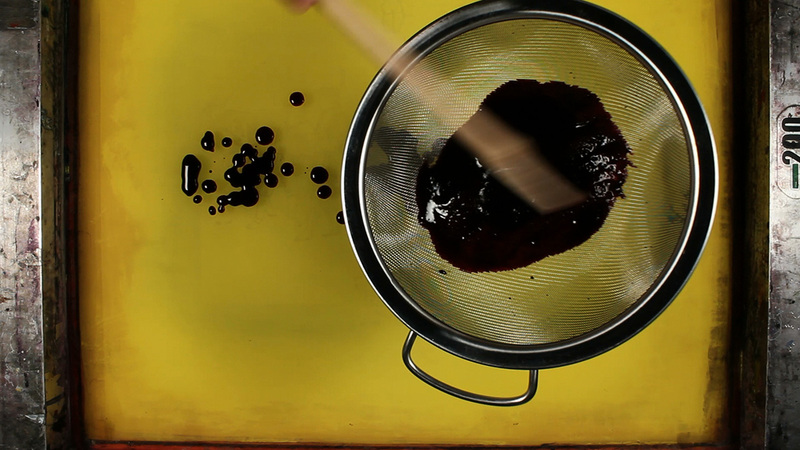 Lisa Myers (LM): I plan to continue a body of work that uses blueberry puree for mark-making, staining and printmaking. For Nuit Blanche, I’ll create a stop-motion animation called Each Portion. In preparation for this, I will share blueberries with different groups of people, which may include the Aboriginal Curatorial Collective, student groups from the Ontario College of Art and Design, and I’d like to connect with the youth group at the AGO. Eating blueberries will be the main focus, but we’ll also talk about stories that have given us direction in our lives. That’s where the kernel of the conversation can start. 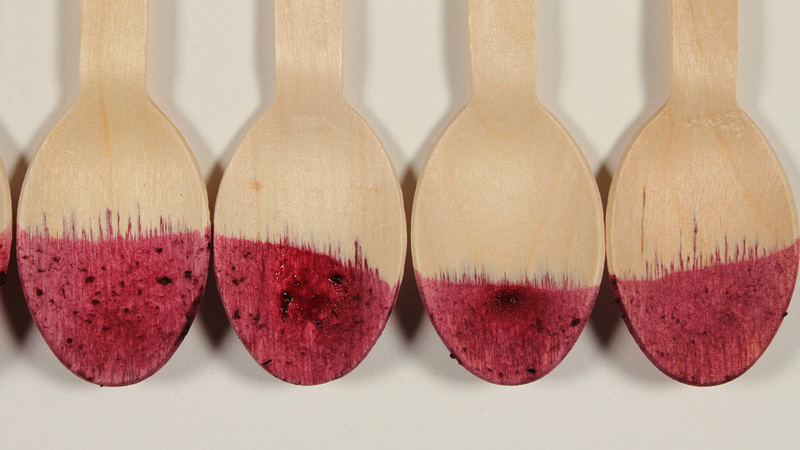 After people eat the blueberries with wooden spoons that absorb the juice, the spoons will be stained, so I’ll collect those and use them in the animation. There will be a trace of somebody consuming something. The idea is that stories are absorbed, as well as food, and that the things we learn, the things we witness, make us who we are. They enable us to locate ourselves in society and in our culture. KM: You’re probably a more discerning blueberry connoisseur than I am, but is it important where the berries come from? LM: They will be wild blueberries from Ontario. Some will be from different places where I’ve picked them and some will be sourced by the kitchen at FRANK Restaurant. Since the season will be a bit late in September, we will need to buy them at the prime time, which is late August, and then freeze them. We’ll thaw them as we use them, which is effective because they extract more juice that way. KM: What else are you pursuing this fall? LM: There will also be work in the AGO’s Community Gallery. This will actually be printed directly on the wall using rolling pins and blueberry puree. Called where heart starts, it will feature multiple lines across the wall. These will be about desire lines and the way that lines, like train tracks and roads, cut through landscape. They connect people, but they also divide people. The work will be about the way that our path through life, our desire line, intersects with different institutions, barriers and laws. Lisa Myers: strain to absorb (2015). Production stills. KM: This body of work began with a story from your family. Can you tell me more about that? LM: My use of blueberries comes from a story of my grandfather surviving on blueberries as he ran home away from residential school. I remember going to his house and he would always have blueberry pie. In winter when we were there, we’d often get frozen blueberries and he’d put canned milk on them. I’m interested in the way materials can carry meaning. His story is a very specific narrative from my family. I don’t want the work to be all about that. I want it to be about the transmission of stories. KM: Your work is often informed by post-colonial critique. Does this affect how your practice functions within the gallery? LM: The gallery is a colonial space and there’s a history of indigenous artists saying, “We need to be in art galleries now. We’re not supposed to be in museums anymore.” I don’t think, “Hey, we won! And we’re here now.” It’s more like, “Oh, we’re here now, what do we do? How do we make this our space?” Part of what I’m trying to include is a social component to the work so that other people will feel like they can come into the gallery. I’m working in the space and making it work for me as well. The goal of Andrew Hunter, the curator of Canadian art, is to create interventions in the gallery. I did question that at one point, “Why does my work have to be an intervention? Why do we still need to intervene?” I guess we do have to intervene. This is a non-neutral space and a non-neutral collection that represents certain collectors’ tastes, certain ideas and certain ideologies. KM: Museums do seem to be changing somewhat as they attempt to engage broader audiences. Would you agree? LM: Do you know the Andrea Fraser article about institutional critique? She did an analysis of institutional critique when it first became a practice. She observed that as you critique the institution. you add to it; therefore, you are still feeding into it. I’m conscious of it being positive for the AGO to be able to say, “Hey, we’re hosting indigenous artists.” That’s why it’s important to bring in that critical voice, ask questions and be really engaged. KM: I’ve noticed that your work includes deliberate processes, almost journeys, such as walking along train tracks as you followed your grandfather’s path, but also the processes of cooking and art-making. LM: I like the idea of taking the time. My work strain to absorb (2015) will be in the show Forage, which will be about food at Harbourfront this fall. It’s a process piece. 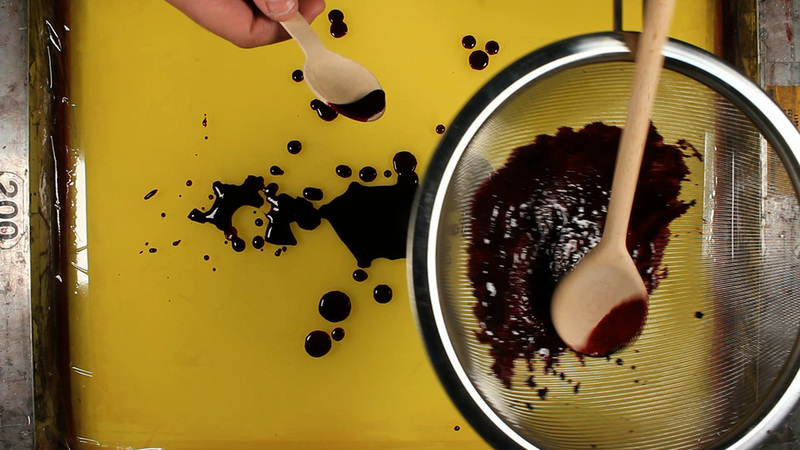 I had made screen-prints with blueberry puree, but they were illustrative. They were maps of the areas that I had walked. One day I wondered, “Why am I doing all of this illustrative work? Why don’t I let the blueberry do what it’s going to do, map itself and tell its own story?” I started putting ink on the screen, and then pulling prints over and over until all the ink was gone. I videotaped those and the video reveals this process that I think links back to cooking and even the way I make the ink. I have to boil the blueberries and then strain them through a sieve. When I screen-print them, I am also straining them again and they’re being absorbed into the paper. When we eat the blueberries, we’re absorbing them as well, so I think it relates back to my history of cooking. Someone once said to me, “Don’t you hate it when you put out a meal and it’s gone so quickly after you’ve spent all that time on it.” That doesn’t bother me at all. I like the process and the journey. It’s nice that you ask that question because I hadn’t thought about the process of making as linked to the idea of the walk being a process. I hadn’t thought of that as something that was congruent. It’s the time that’s important, but I think it’s also about learning something through those processes. It’s important to make something that is almost iterative so that I can determine what the work will be in the end. KM: What about the audience? Or, do you even think of the people eating the blueberries as audience? LM: I don’t think of them as audience. I consider them to be collaborators, but then I was wondering about how we share authorship when we ask people to collaborate. There’s a lot of social practice that is supposed to be about collaboration and creating social change, but I don’t know that it actually does that. I was thinking of the collaborators as people who could participate in the culture that’s in the gallery and maybe shift that, but that might be too idealistic. KM: Will you document your exchanges with the people who share blueberries with you? LM: I haven’t planned to do any kind of documentation. I’m ok with it just happening and being about that social moment rather than a document of that social moment. The exchange doesn’t have to be a spectacle. The spectacle will be that little spoon on the night of Nuit Blanche. Myers’ residency at the AGO runs until November 6, 2015. 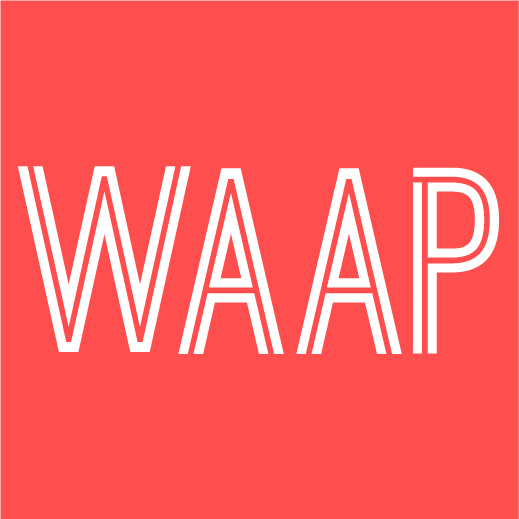 Each Portion will be on view at the AGO for Nuit Blanche, which takes place on October 3–4. Krystina Mierins completed her MA in Art History before working in the architecture department at the Carnegie Museum of Art. She has also worked at the Carleton University Art Gallery and the McMaster Museum of Art. She is now an independent writer based in Toronto, and her writing has appeared in publications such as Border Crossings, Artillery and Ornamentum.